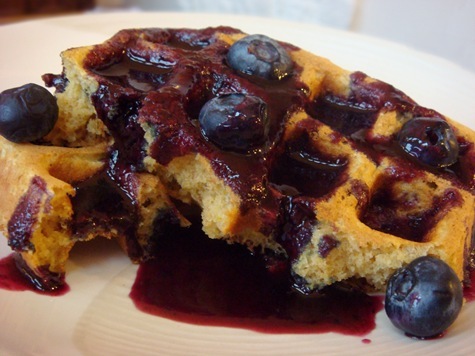 Looking for a healthier waffle that is also great tasting? These whole grain waffles are made with whole wheat flour, oat flour (ground oats) and wheat germ. After making the Buttermilk Waffles (with no separated eggs), I used some of the same techniques to try and make these as light as possible. Replacing some of the flour with cornstarch and letting the batter sit for a little while before cooking really helped make these waffles great. With the heavier whole grains, they will never be quite as light as all-white-flour waffles, but they make up for in flavor what they lack in airiness. For Waffle Tips & Suggestions, click HERE. Mix dry ingredients in a large bowl. In a separate bowl, mix remaining ingredients. Add wet ingredients to dry; mix well. Let batter sit for 30 minutes before cooking. Do not stir batter after letting it sit. Use a ladle or measuring cup to pour batter evenly into hot waffle maker (about 2 scant cups for the 4 small Belgian waffles in my waffle maker). Cook for about 3-5 minutes, or according to directions on your waffle maker. Remove waffles from waffle maker and place on a wire rack (not a plate). Serve immediately or keep warm in a warm oven (very low heat). * To make oat flour: Place rolled oats in a blender or food processor and blend until fine. **To make sour milk: add 2 Tbs lemon juice to a 2 cup measuring cup, fill to 2 cup line with milk (whole milk works best). Stir; let sit 5 minutes before using. If using sour milk, add an additional 1-2 Tbs flour to batter. To freeze: Cool waffles on a wire rack. Place in Ziploc bags and freeze. Reheat individual frozen waffles in a toaster (for crispier edges) or microwave (for a soft waffle).